The Vancouver Condo Buzz » From $268,900! New Vancouver BLOCK 100 Condos in Southeast False Creek Waterfront District by Onni! Affordable False Creek Block 100 Vancouver Townhomes & Waterview Condos for Sale! « SPECIAL DISCOUNTS at PARK AVENUE Surrey City Centre Condo Towers! 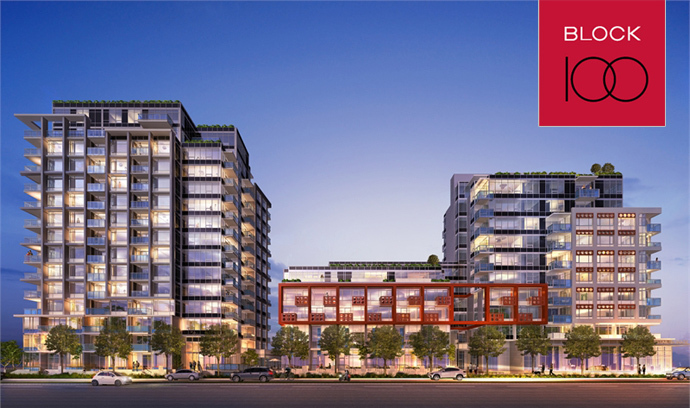 Two High-Rise Landmark Surrey Park Avenue Condos by Concord Pacific > GET IN EARLY! Modern Design. Optimum Value. A World Class Community. The new Southeast False Creek Vancouver Block 100 Condos is a new Onni development that will be positioned centrally on the 100 block of East 1st Avenue between Quebec Street and Main Street. Block 100 Vancouver condos is a new community located in the Southeast False Creek district, one of the city’s newest and most exciting neighbourhoods. The preconstruction Vancouver Block 100 Condos by Onni will be launching Fall 2012. Southeast False Creek Vancouver real estate starting from just $268,900, so take advantage of this ground level opportunity as a first time homebuyer or investor! Just 1 minute from the Seawall/waterfront, 2 minutes from the brand new Urban Fare and three minutes from the SkyTrain route that connects you to all places in the Lower Mainland, the False Creek Vancouver Block 100 Condos by Onni is the perfectly situated development that you must see to believe! This world class Olympic Village neighbourhood features optimal value in today’s market and will launch presales in November 2012! Positioned perfectly on the 100 block of East 1st Avenue Vancouver Block 100 Condos for sale is located in the most exciting new neighbourhood called South East False Creek. Nestled in the heart of this world class city, Block 100 Vancouver condos celebrates both modern design and waterfront living at its best. Stay Tuned for more exciting news about this project! NEW INFO! Priced from just $268,900 during the pre-construction phase, the new Vancouver Block 100 in Southeast False Creek district will offer only 231 affordable homes for sale. The Block 100 floor plans will range from approximately 450 square feet to about 1,250 square feet in size with many layouts to choose from. The sales company, interior design and developer is Onni Group of Companies. The new Southeast False Creek Vancouver Block 100 condo architecture is by Chris Dikeakos Architects Inc., an award winning firm. The location is on the 100 block of East 1st Avenue Vancouver (which is between Quebec and Main Street) in central South East False Creek, just seconds from the Olympic Village and the waterfront seawall. 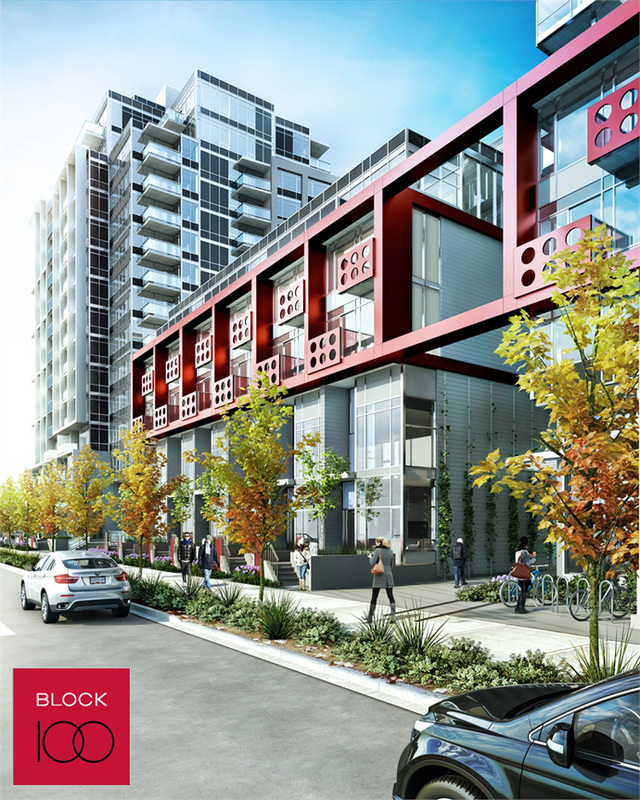 The Block 100 Vancouver condo project by Onni Group of Companies will consist of 3 buildings which have both condo residences as well as boutique Vancouver Block 100 townhomes. The project will also feature on-site amenities which will include retail space on the ground level, indoor fitness gym, clubhouse lounge and roof top decks, giving both indoor and outdoor amenity spaces for resident use only. The prices start from under $270,000 which will attract all types of homebuyers including first time buyers, downsizers from single family homes, upsizers from smaller downtown Vancouver condos and investors too. Within walking distance to the Canada Line SkyTrain station as well as to major retail and community amenities, the Southeast False Creek Vancouver Block 100 Condos and Townhomes by Onni will be situated in an enviable location within a completely new neighbourhood, which is very attractive to many buyers. 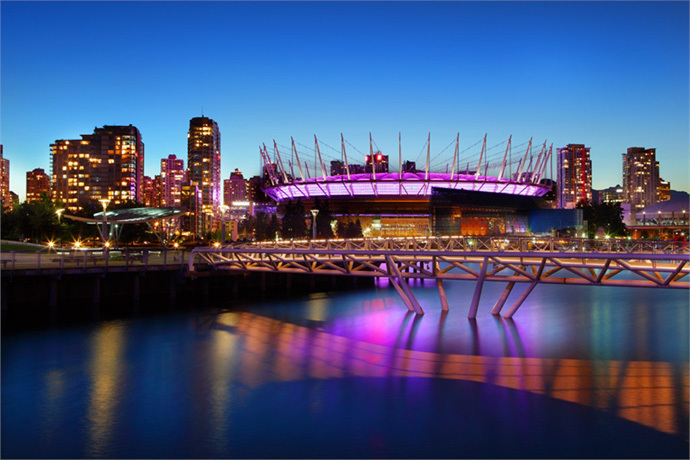 The famous seawall and both the Olympic Village and Main Street SkyTrain stations are within walking distance. In addition, the deposit structure has been released as 5% at the time of offer, 5% within 60 days after the acceptance, 5% 10 days from the BP and 5% within 180 days of the BP. This is a total of 20% deposit on your new home at the Block 100 Vancouver condo project, which is very affordable. The False Creek Vancouver Block 100 Townhomes and Condos are designed to blend a timeless aesthetic both inside and out. Functionality and smart technology is prevalent throughout the residences and building, making it a truly modern development. In addition, the new Vancouver Block 100 townhomes and condos will feature high quality materials including high performance kitchen appliances, laundry appliances that are water and energy efficient, flat panel contemporary wood cabinets and frameless glass shower enclosures/deep soaker tubs. Also, the interiors will have composite stone counters. There is underground parking at the Block 100 Townhomes and Condos but virtually everything that you need is accessible by bus, SkyTrain, foot, bike or water taxi. The Southeast False Creek Block 100 townhomes and Vancouver condos are also within walking distance to Creekside Park and Thorton Park along with the entire Olympic Village neighbourhood. 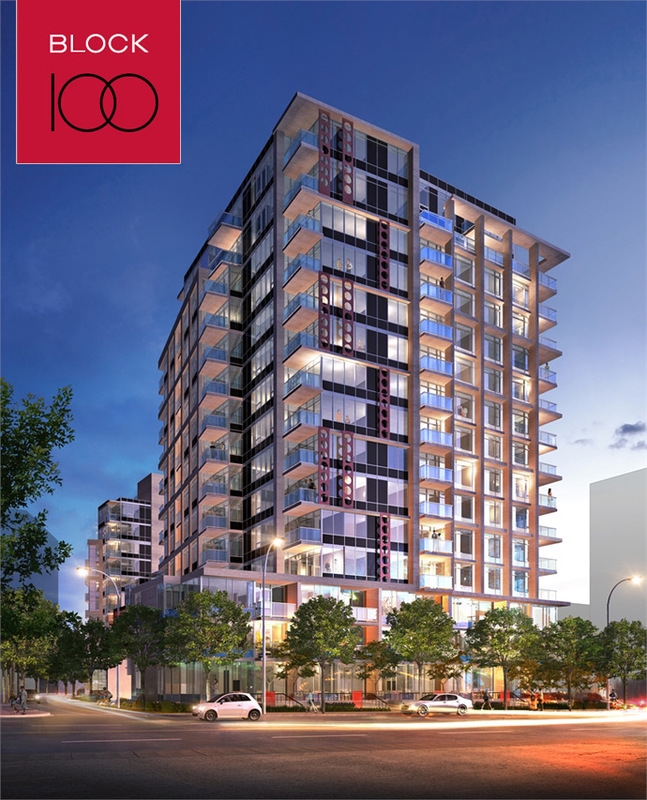 Excitement Builds for the Block 100 Vancouver Southeast False Creek Condos! The Onni Group of Companies has a great reputation amongst homebuyers in the Greater Vancouver area and the are well noted for their master planned communities, finishes and affordable homes. Here at the new Southeast False Creek Vancouver Block 100 condos, home buyers will get a chance at owning in this prime neighbourhood from just $268,800 (subject to change at any time). 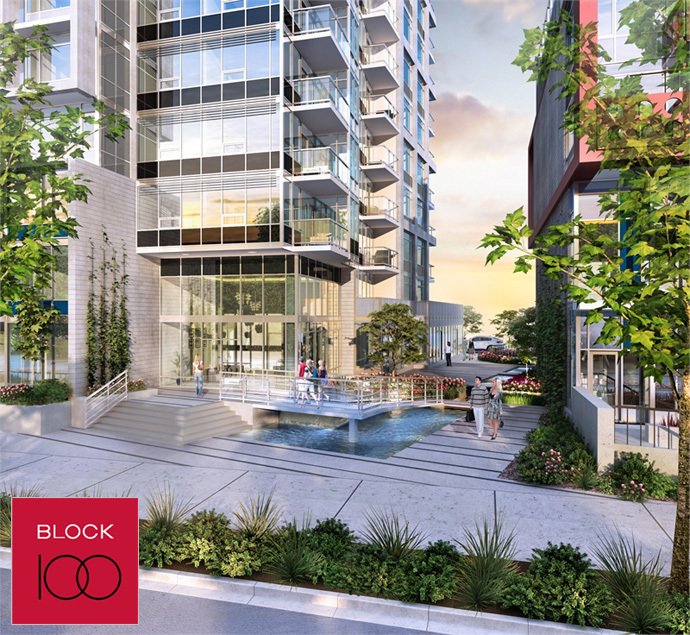 The Block 100 Vancouver condos are of course situated in the new and exciting Southeast False Creek neighbourhood where you will find many new community amenities within a few steps from this new Onni project site. These include such things as great restaurants, coffee stores, parks, dry cleaners, grocers, Legacy Liquor Store, Urban Fare and even a London Drugs, many of which are situated just blocks away from the Vancouver Olympic Village site. If you haven’t been around this area, the new Southeast False Creek Vancouver real estate district is changing very quickly. Uniquely positioned on the 100 block of Main Street, Vancouver Block 100 condos for sale is all about waterfront living at its best as well as modern design both inside and out.